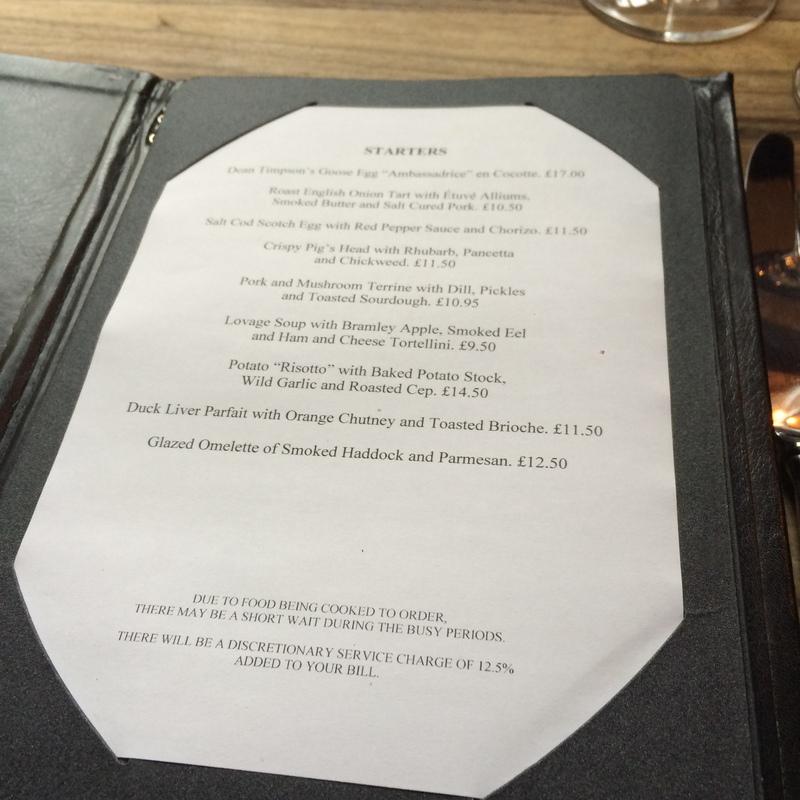 This Michelin star restaurant has been on my to-eat-list (yes, I have one of those…) for quite some time and I was thrilled when my Kent-based friends Helen and Pete suggested we go there for lunch together. We booked it several months before and finally went in May this year (sorry it’s taken me forever to do the write up!). Quite unlike most other one star places The Sportsman is really relaxed and rustic. You place your order at the bar (while looking at the daily changing menu noted down on the black board next to it) and go sit down. The food takes a similar approach and is really well prepared out of the best ingredients but with a rustic no-fuss approach. Which people love! Especially chefs, who vote this as their favourite restaurant year after year. I obviously like the approach too, and from the get-go it’s pure perfection. The three different types of bread are all very good, the olives are of the buttery kind and the butter is just heavenly. A good start. Pete and Helen are just as excited as I am, although they’ve been here before and Pete and I can’t resist the oysters, which were served two ways and both delicious! It was only also Pete and I who ordered starters, but we shared them at the table. 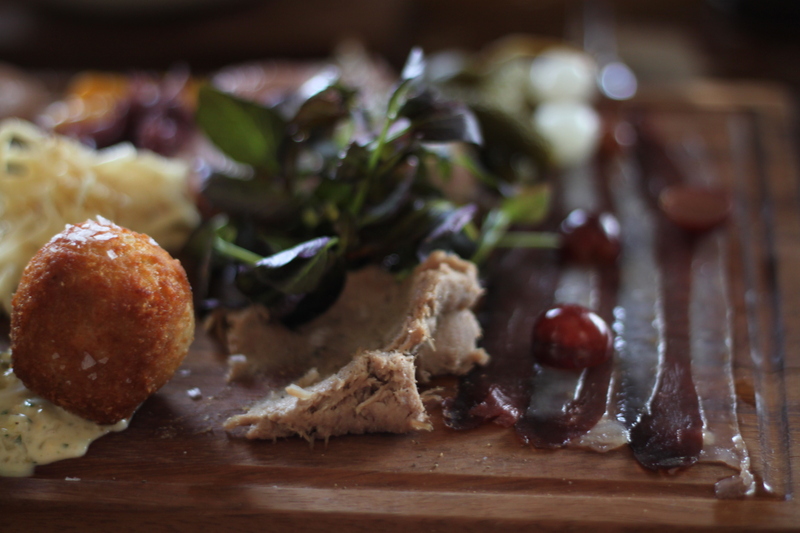 The terrine with mustard, pickles, grilled sourdough and crispy scratchings was so nice. Everything was just perfectly executed. My tomato, burrata and pesto may look simple, but it was perfectly put together and had the best pesto I’ve ever tasted. Helen had the beef and Yorkshire pudding which was pure perfection as well. Just look at that plate. My pork was incredibly tender and was served with a deliciously fluffy mash and a mustard jus. Just perfect. Pete had cod, again cooked to perfection, with asparagus and a delicious chorizo sauce. It’s classic food, but still with a few twists. I was quite full after my pork but would not turn down pudding in a place like this and so ordered the rhubarb soufflé with rhubarb ripple ice cream. It’s was amazingly good. 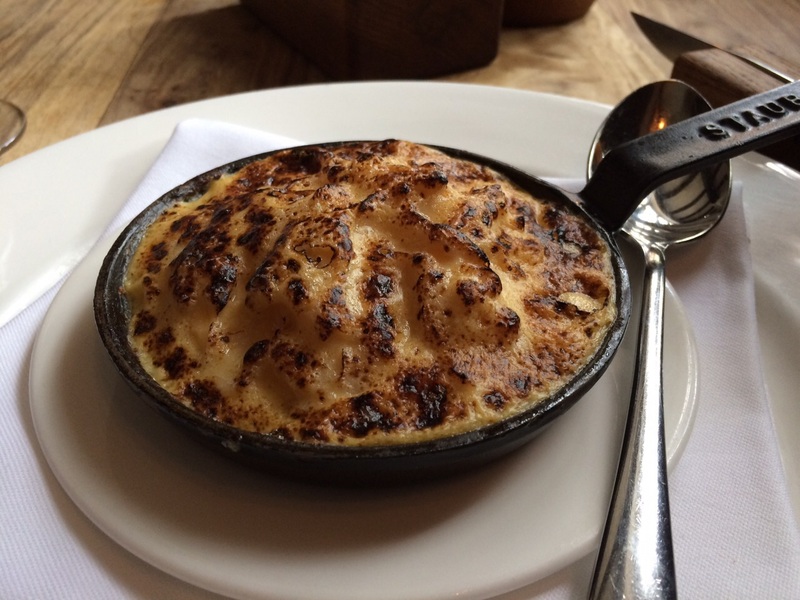 Strong but subtle flavours and the softest soufflé! Helen’s warm chocolate mousse with with salted caramel and milk sorbet was equally dreamy and although familiar flavours, the fun texture is a great addition. The whole lunch was really relaxed and cosy, with two well-behaved children, and such a treat! Afterwards we went out into the sunshine and down the beach to look for sea shells and fossils. Such a wonderful day – and lunch! Chefs are like rock stars these days with more exposure ever than before. I quite like that, and I think the chefs do too. The chefs I know personally always wanted praise for their creations and stood up tall and proud when customers wanted to thank the chef personally. One of Britains rock star chefs is definitely Tom Kerridge, owner of the only pub with not one but two Michelin stars. Quite the accomplishment. 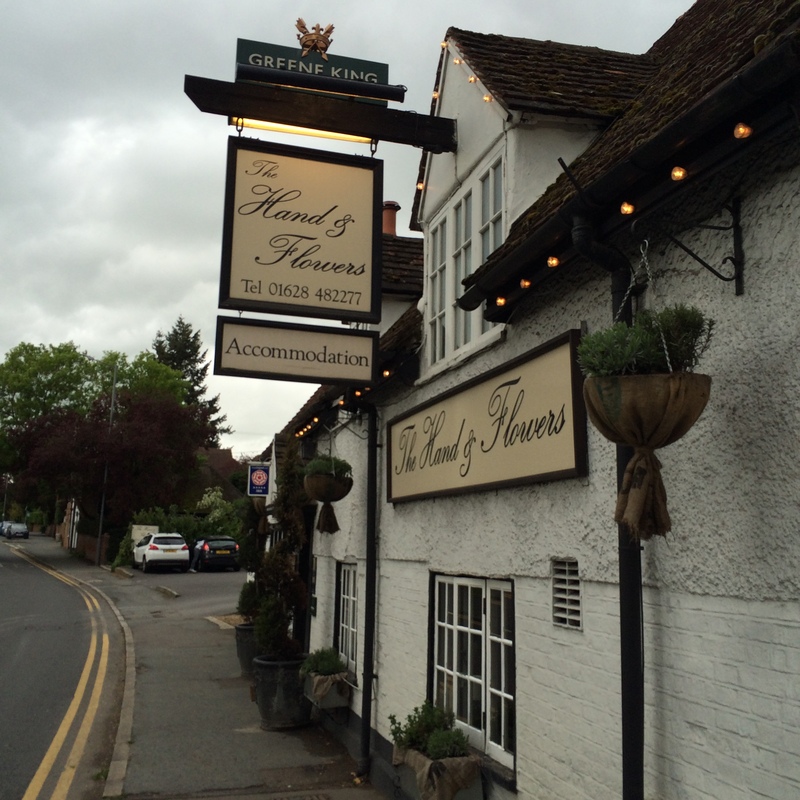 In May my friend Laura and I had a fabulous Sunday lunch at The Hand & Flowers in Marlow and the food was just as amazing as we had hoped. Luckily, since we made the reservation a whole year earlier. Yep, that’s how popular this place is. Get in there early if you want to book a specific date. The pub was a lot smaller than I had pictured in my head, but just as cosy. The service was friendly and relaxed and our waitress helped us decide what to order, since we had some trouble narrowing it down (I wanted to eat everything!). 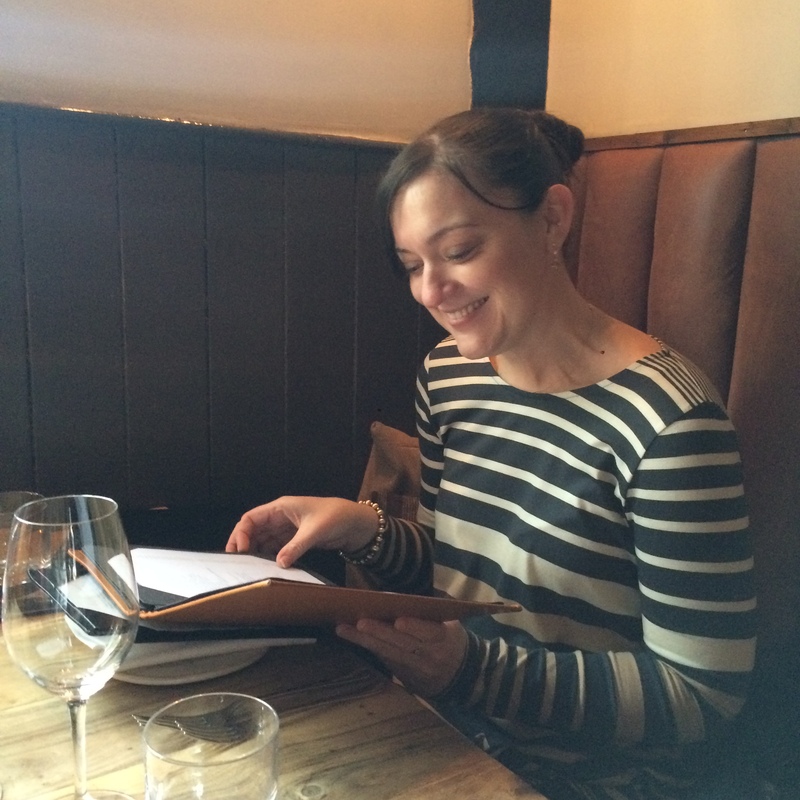 Laura literally studying the menu. 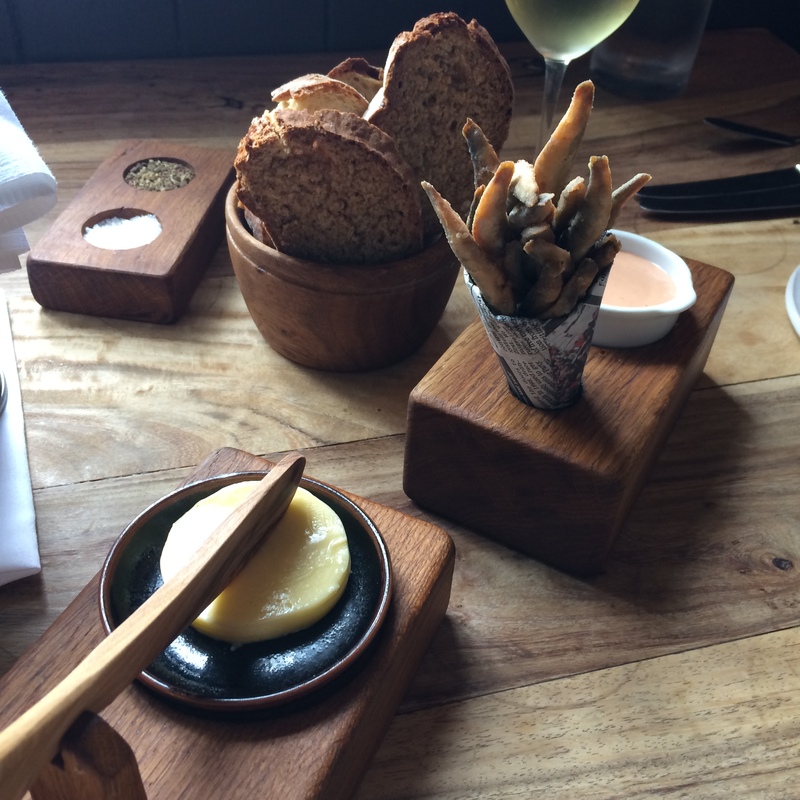 We started our meal with the bread basket and fried whitebait that appeared as soon as we had ordered. I love the newspaper cone for the fish! Laura then had this fabulous glazed omelet with smoked haddock and parmesan and it was probably even more delicious than it looks. 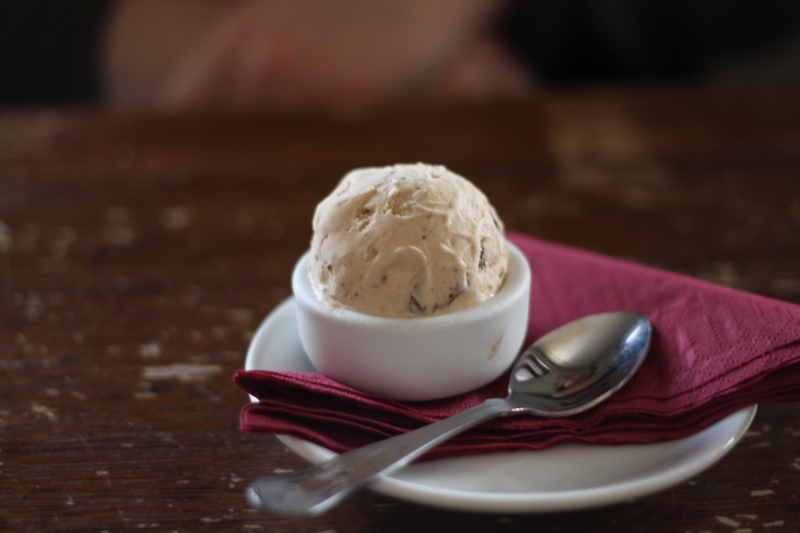 Light and fluffy yet full or flavour. 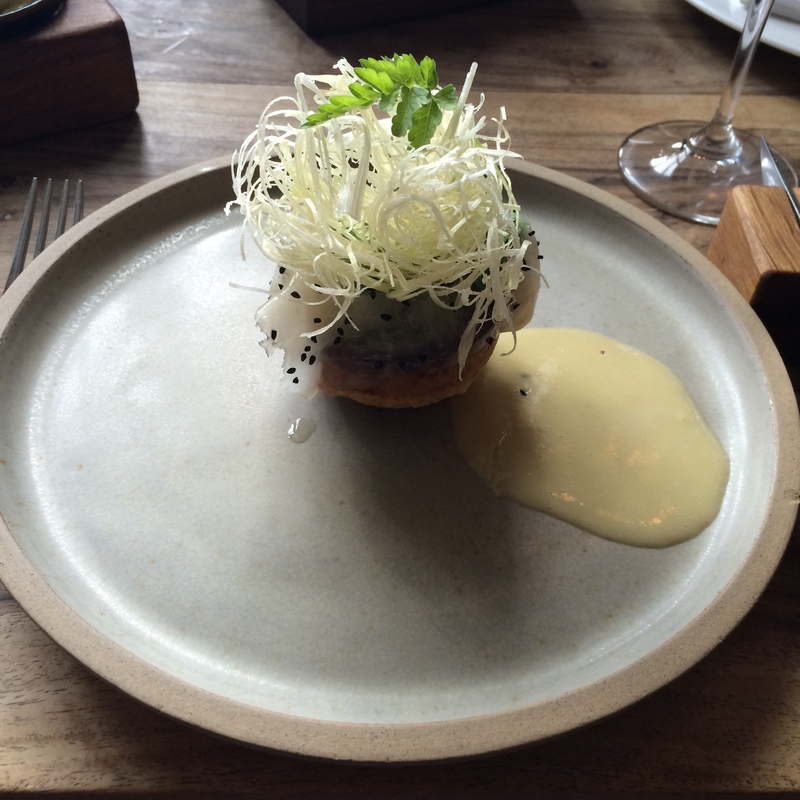 After careful consideration I chose the onion tarte with pork and smoked butter. Wow! It was absolutely fantastic. Flaky, subtle, not too rich and lots of flavour. 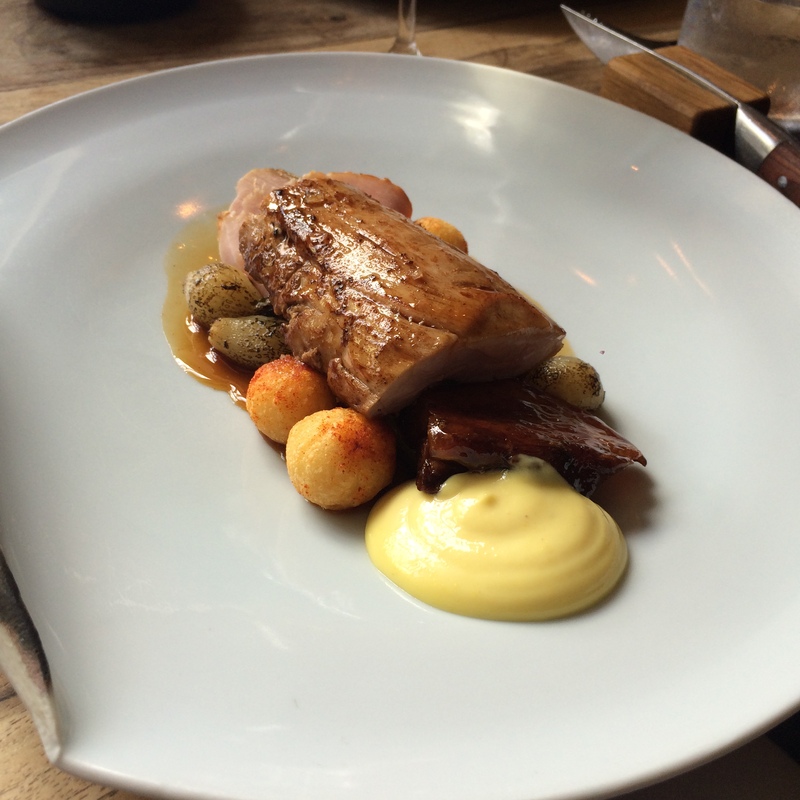 I then carried on with the nicest pork tenderloin I’ve ever eaten (so tender and juicy! ), pork cheeks and garlic sausage, little potato balls and small onions. Utterly delicious! 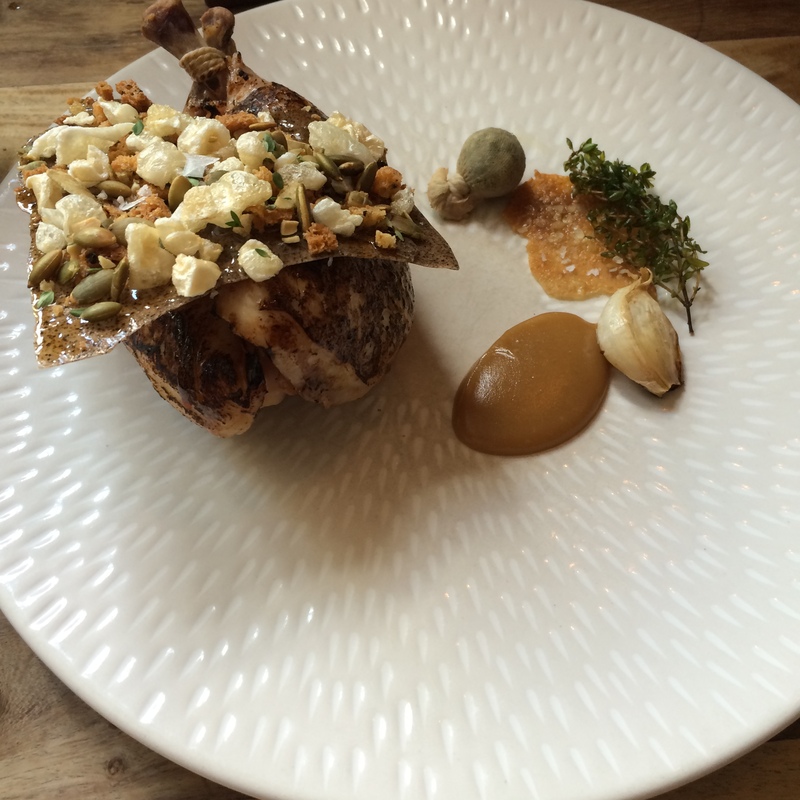 Laura had the beer roasted chicken with caramelised cauliflower, garlic purée and mushroom crunch. She was as amazed with her main course as I was with mine. We probably sat in silence for a minute, all I can remember is the what I tasted in my mouth. The food is, as you would expect from a pub, hearty and filling. But sadly we didn’t have room for pudding. I prefer savoury over sweet, and so does Laura, so we were very content leaving the restaurant and walking very slooowly to the train station. It was such a great meal – I can’t wait to go back. This past weekend was absolutely glorious with the sun shining both days so to go for a for a nice long walk followed by a pub lunch was the perfect Sunday activity. With sunglasses on I met Laura at Belsize Park around lunch time, where she showed me around her new neighbourhood. 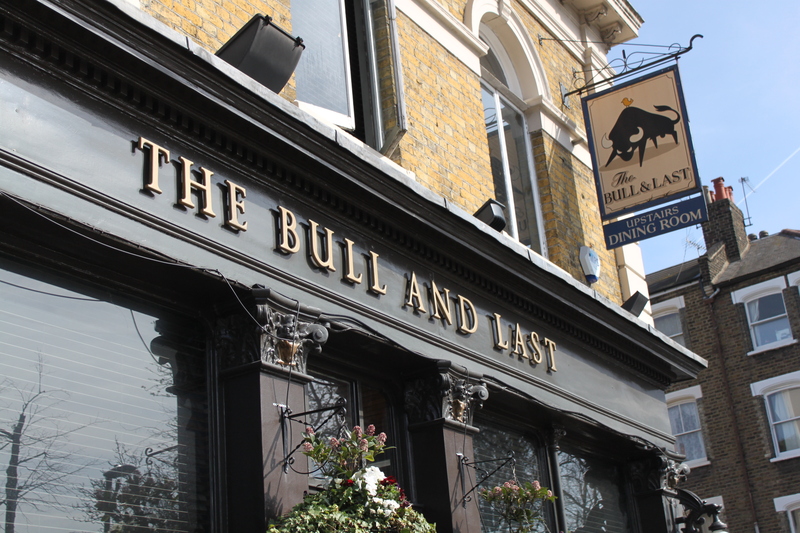 We then walked across Hampstead Heath and onto The Bull & Last for our 2.30 reservation. We liked the pub immediately. The decor is traditionally pubby with some nice touches, like double doors to the loos, stuffed animals and hunting trophies. The groundfloor was really busy and quite loud when we walked in, perfect for chatting with friends, but it was nicer to eat upstairs in the more quiet dining room, like we did. 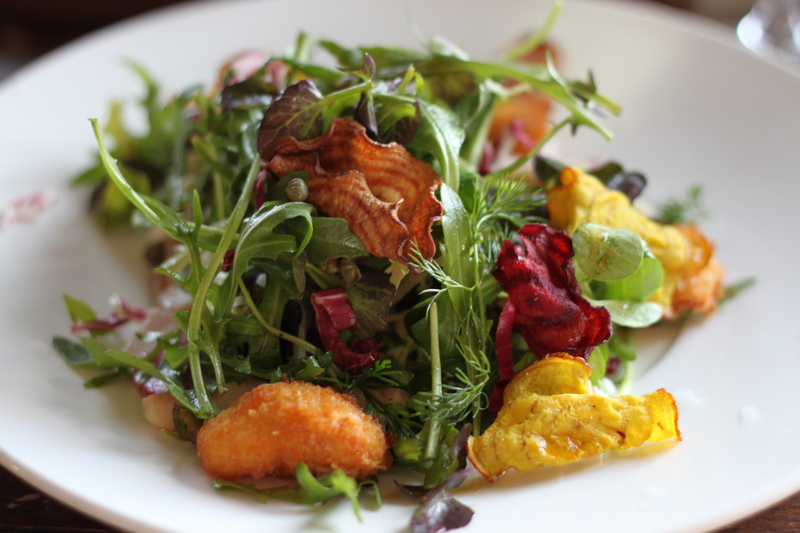 I chose a salad with beetroot, horseradish, smoked eel and cod’s cheeks and it was an absolute delight. It had different textures (smooth eel, crunchy beetroot crisps, creamy horseradish) and lots of nice flavours. Laura had some of it and we also had a side of triple cooked chips. I mean, how could we resist? 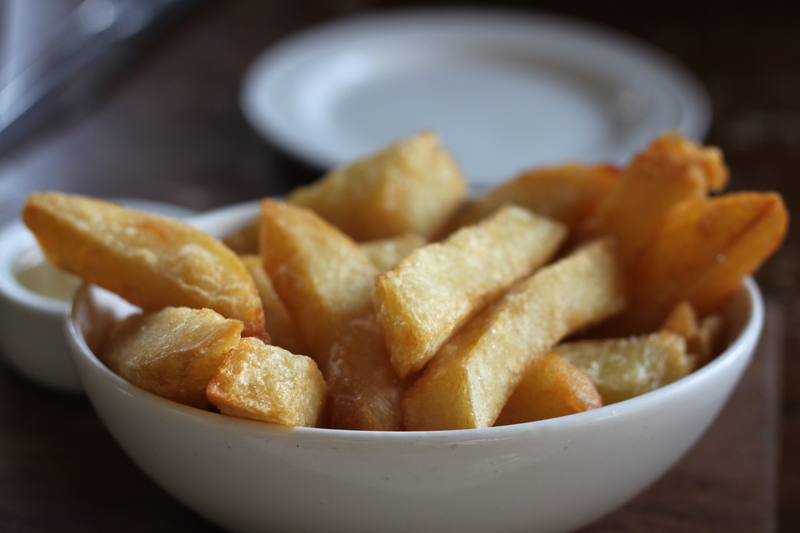 They were lovely and crisp on the outside and soft in the middle and served with homemade mayonnaise. Need I say more?! Instead of the maincourses we chose a board each; fish for Laura and meat for me. They were huge and it would have been perfect to share one for two people as a starter. As a maincourse it was definitely enough and we were pretty full by the end of it. 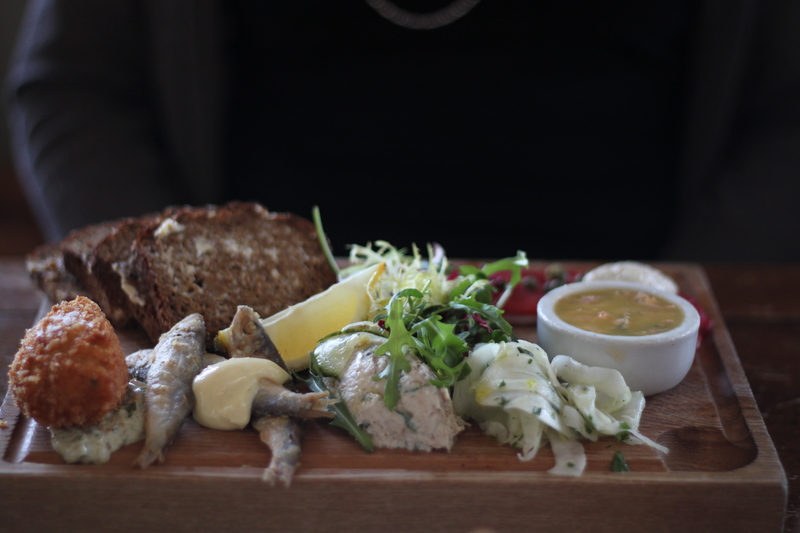 The fish board consisted of a haddock croquette, sprats, mackerel paté, potted shrimps and beautiful gravadlax (with beetroot for the colour I presume) and soft soda bread. My meat board was equally packed with goodies; the chicken liver parfait was velvety smooth and probably my favourite as well as celeriac slaw, thin slices of duck breast, duck rillette and a lovely ham hock terrine. 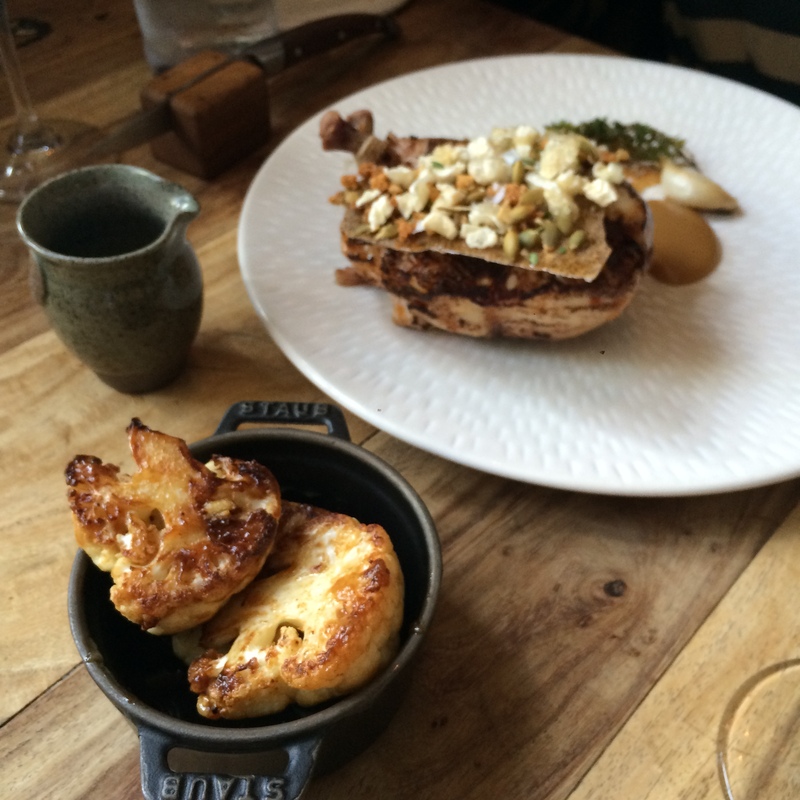 The pig’s head was shredded pieces of meat in a croquette and the bread was toasted and brioche-like. I enjoyed it all, although some things could have done with a tad more seasoning. As I said, the boards were quite filling, but not having icecream on a sunny day is almost a crime, so we had a scoop each after a little breather. 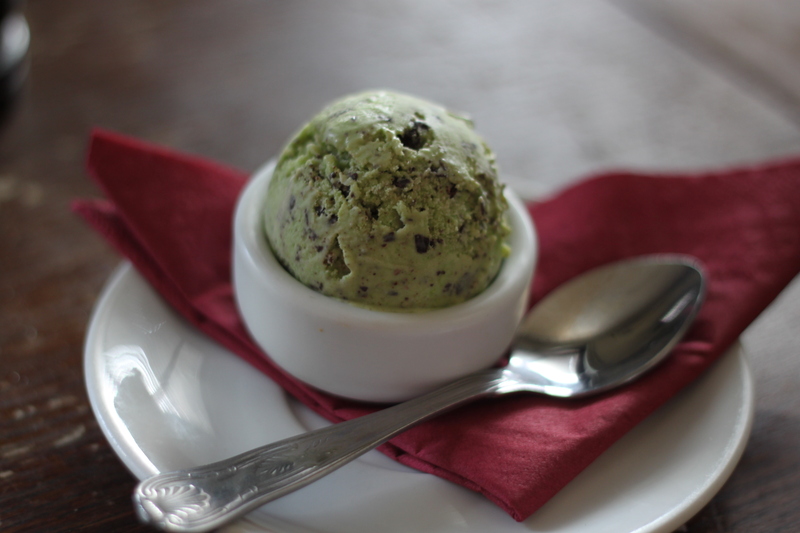 Laura’s prune and armagnac is above and my mint chocolate chip is pictured below. We spent around two and a half hours in here and enjoyed every moment. The service was good and relaxed and you definitely didn’t feel rushed. And since we were part of the late lunch service they probably didn’t need our table until dinner service a bit later anyway. As soon as we stood up it hit me how full I actually was, so we decided to walk some more to digest the food. After a stroll to Highgate and over the Heath we were back at Belsize Park and it was time to go home. The countdown to our holiday has begun. It is two weeks until we go home to the South of Sweden for a week. Can’t wait! 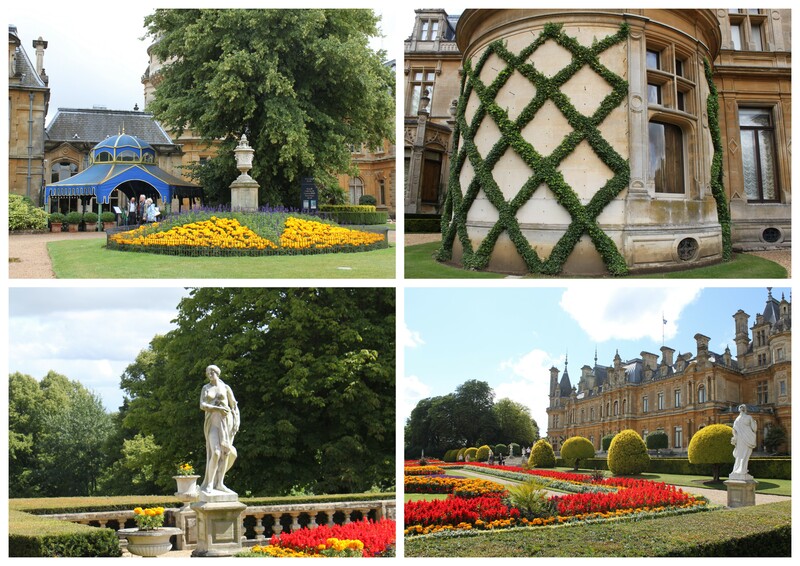 So it was great to prepare for our holiday with a mini break in Bucks with Chris’s mother. We got there by train on Friday, quite late, and only had a glass of wine and a chat before bed. The next day we had a nice lie-in and decide to venture out despite of the terrential rain. 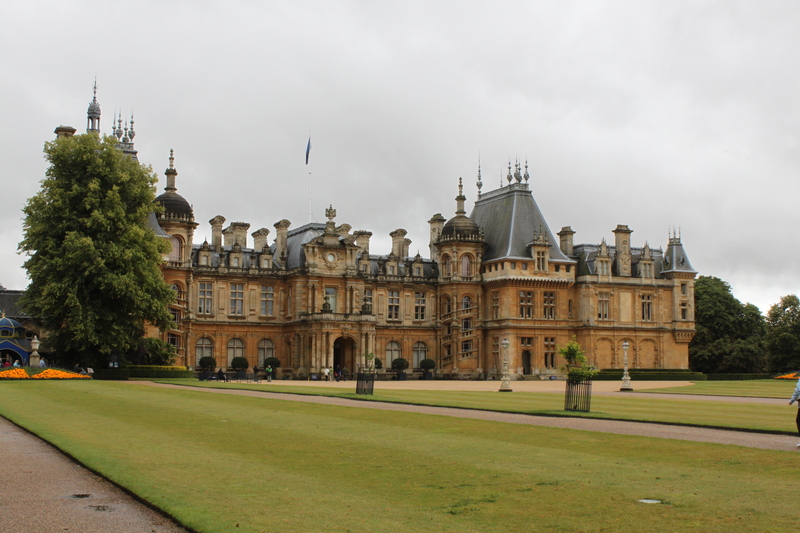 We went to Waddesdon Manor, the home of Ferdinand Rothschild. There were plenty to see inside so we could escape from the wetness outside. The manor certainly had grand interiors with marble, gold inlay on the walls, several drawing rooms and magnificent chandeliers. I enjoyed the layed tables and the china nad silver services the most. 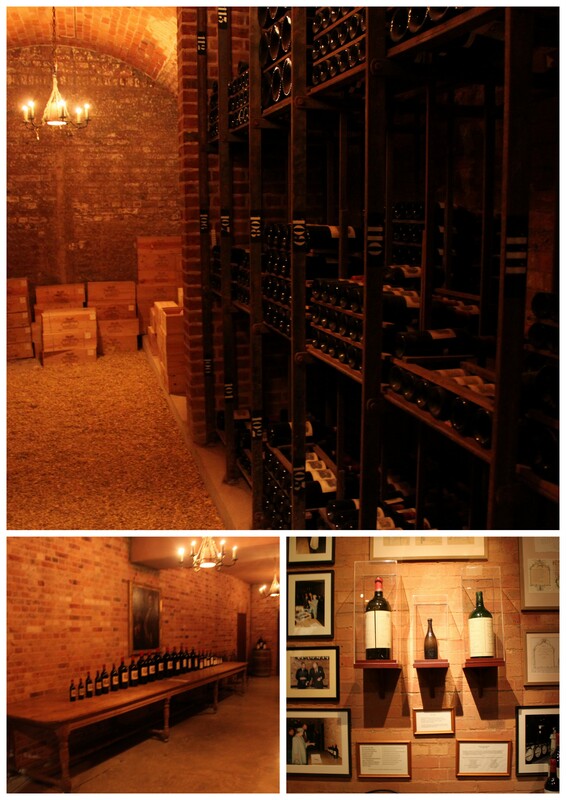 We also had a look in the wine cellar, where they keep some of the family wines. 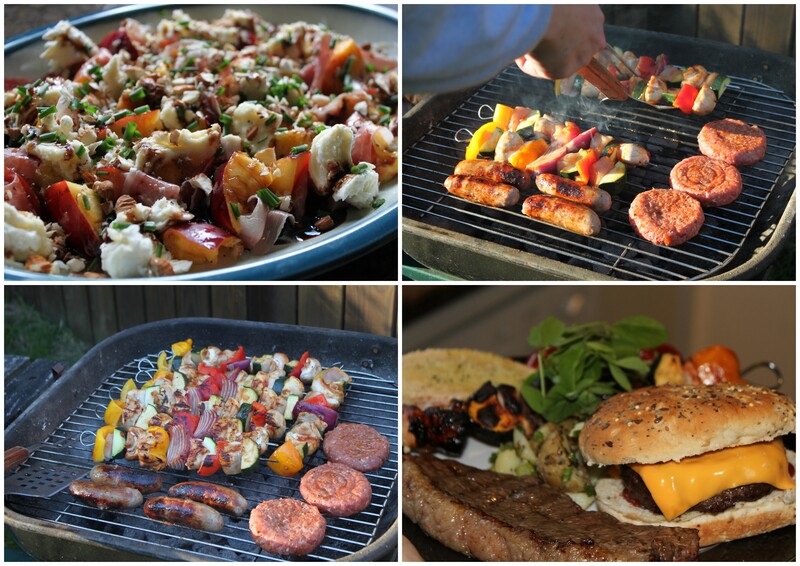 The weather improved in the evening and we could even have a barbeque. We had foodto feed an army for just the four of us, and I am still impressed with how much we managed to eat. As a starter we had a lovely salad with peaches, mozzarella, parma ham, crema di balsamico, honey, chives and chopped almonds. After that we tucked in on steak, chicken kebab, tuna, burgers and sausages with plenty of salads and garlic bread. We ate and ate because we decided to skip dessert, but of course it came out anyway. 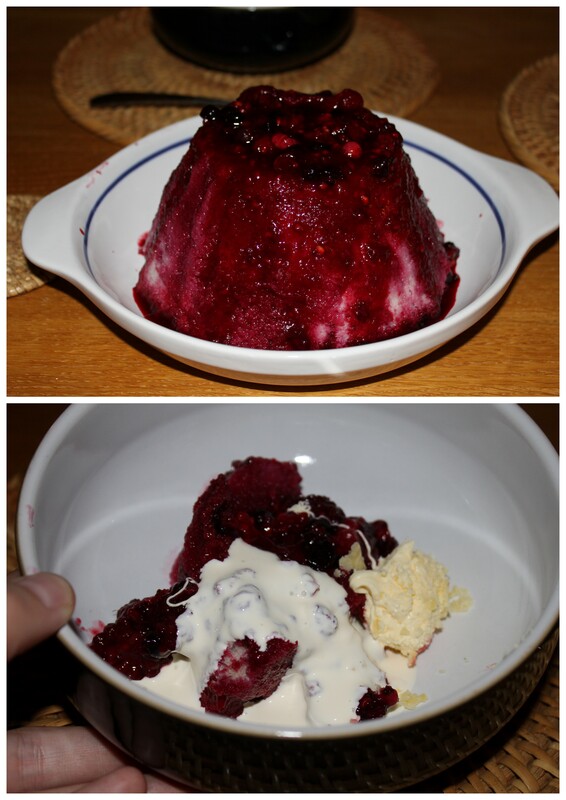 It was summer pudding, which I’ve never had before, so I had to try it. I think it is safe to say I have not felt fuller in my life! Yesterday we spent the day watching golf (Christopher) and looking through recipes (me) and just chilled out as you do on Sundays. 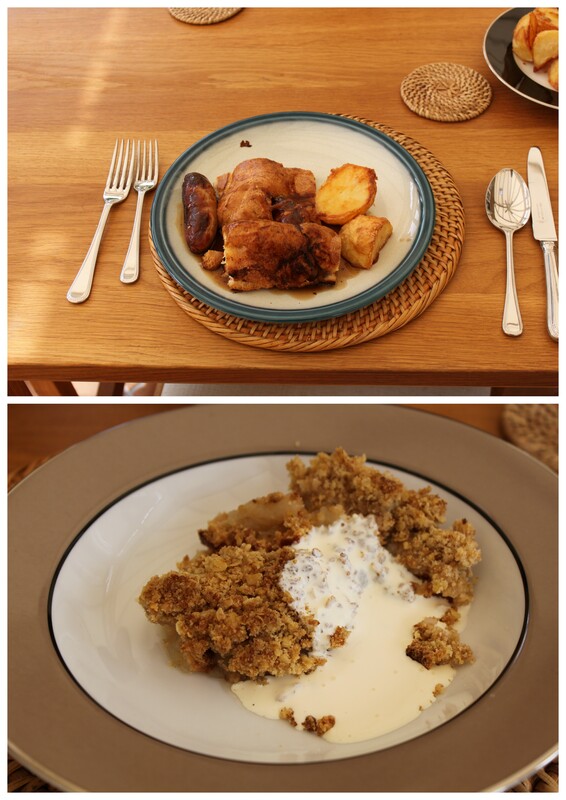 Eileen had made a proper Sunday lunch with toad in the hole, roast potatoes, gravy and lots of different vegetables finished off with an apple crumble. Lovely!